Karina's Kreations: Stampin'Up Party Panda Sneak Peak! 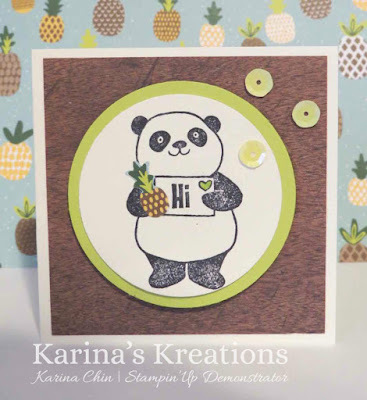 Stampin'Up Party Panda Sneak Peak! This super cute card is made using the new Party Panda stamp set which is available Jan 1 for FREE with a $60 order. The pineapple is punched out of Tutti Frutti Designer Paper using the new Itty Bitty Fruit Punch Pack. If you can't wait until January 1, I recommend gettign the starter kit. You get to choose $165 in product and pay only $135 plus you get free shipping and GST. Then you can order your Party Panda stamp set on Dec 1 with the preorder.